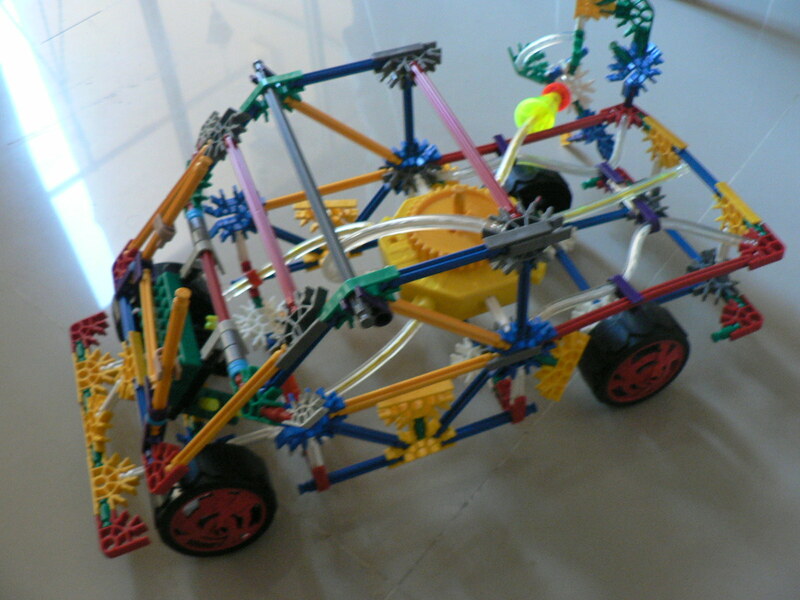 Raghu building with K-nex, Bionicles, Lego and Wood. 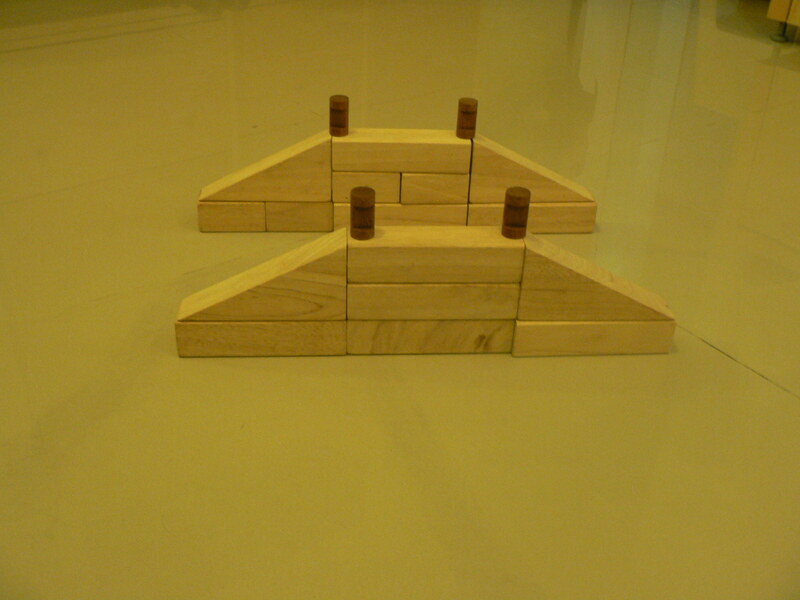 The wooden one was a lovely surprise one evening… its a train engine. Today Raghu browsed the Lego website all by himself. I was sleep deprived and trying to clean up 15 days worth of dust (this is one heck of a dusty place) so that we would not sneeze every time we moved something. We just returned from the trip to my parents in Bangalore. So i was unavailable mentally and physically. Z was sleep walking around the house and hence i could not ignore her either. Anyway… Raghu called me to see a brief 15 sec clip of a new Bionicles product video online. Not sure how he managed to figure out the site… he is rarely online or even on the computer. 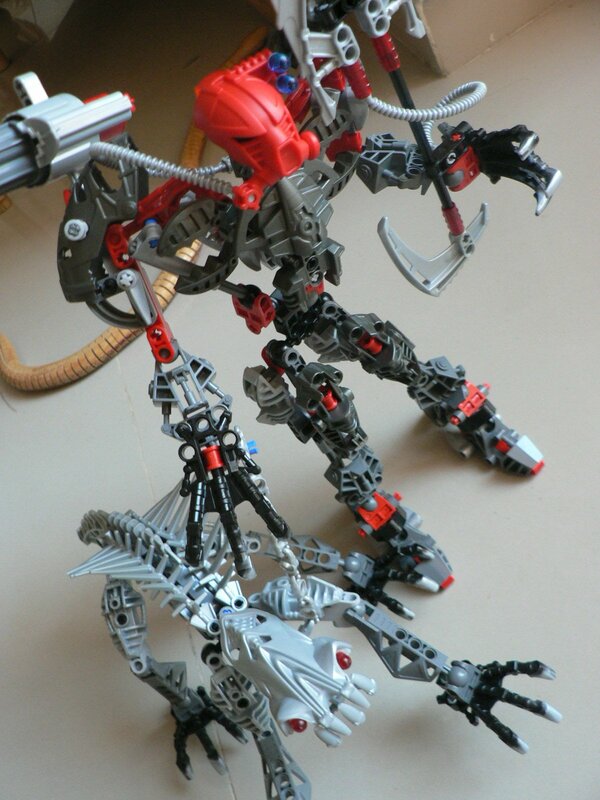 After about an hour or so he walks over for some lunch and there in his hand is a miniature, almost identical replica of the Bionicle-flying-machine he’d shown me earlier. He’d improvised with motors from the aeroplane, batman’s vehicle-slinger-thingy and some other random pieces… that when put together in a particular way really looked like it. His attention to detail and interest in motors, electricity, Lego creations of ideas he has etc. has been a pleasure to watch. It makes me aware of the sheer sense in doing/learning about that which interests us vs. that which somebody thinks we ought to know. Thru his Lego inclinations he touches upon math, history, spatial thinking, diagrams, verbal descriptions of his creations, and much more. Which class lesson can make that claim to fame? I am becoming a turtle. I disappear into my shell soon as i hear condescending chatter aimed at kids, pinching of cheeks that are not owned by the pincher, answering in sing-song mode for a child who could have answered, etc… I have never been so non-gregarious and anti-general-conversation as i am now. I guess i don’t know where to begin/end when i’m in such situations. It is hard to hear a mother say “well a smack now and then is a good way to keep them in control” or “whenever i talk to my son about stuff he should or should not do, he covers his ears and closes his room door on me” Its tough to speak cordially and continue a conversation with such mothers. And to talk about children as inconveniences is deplorable. A child is “good” if he or she will allow the parents unlimited time to themselves or time for a movie etc. So otherwise the child is what? Bad? Why did we have them? Raghu and I watched E.T. 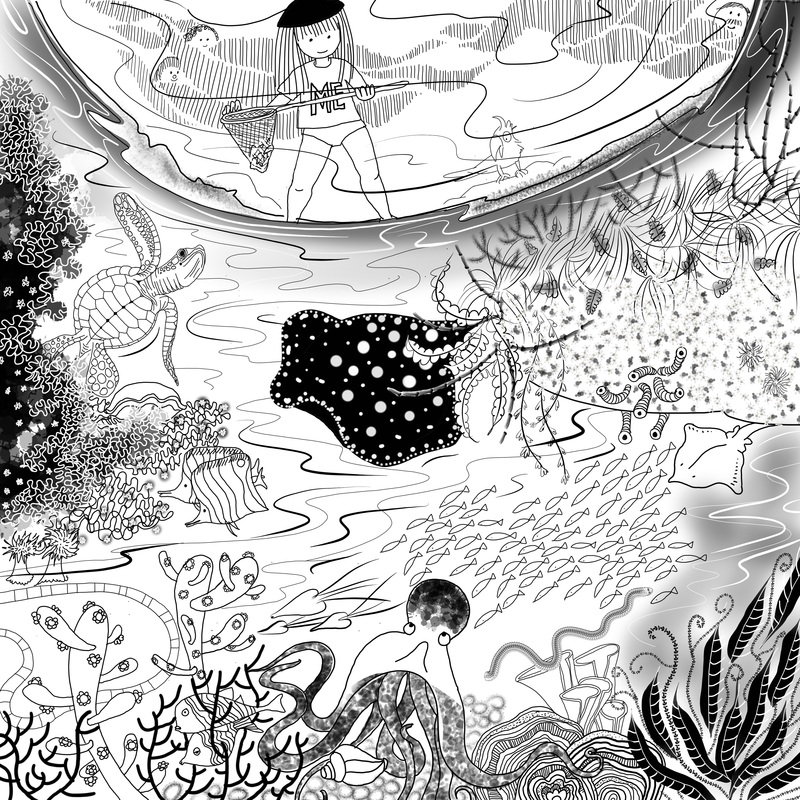 He loved it, i love it and remembered old coloring books of mine that had the most famous scenes in the movie. 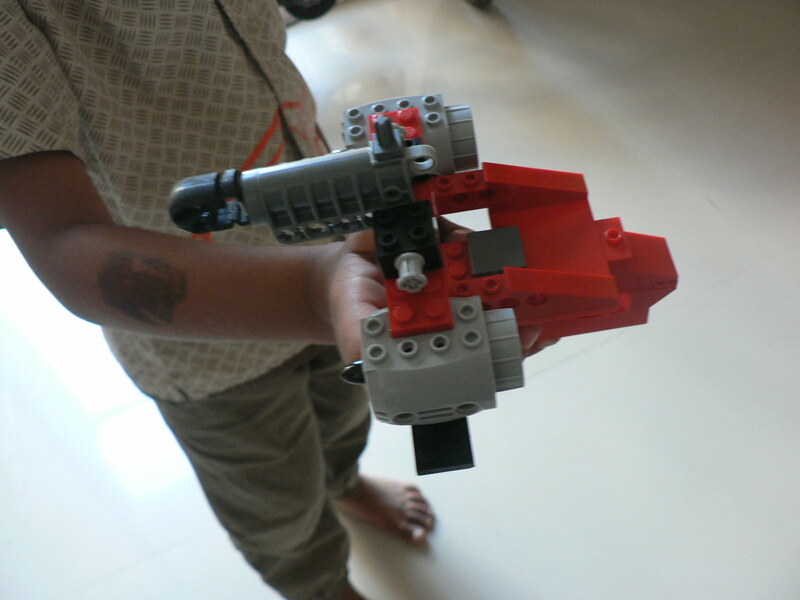 Raghu built a Lego spaceship type structure… and declared it E.T’s space ship to go home. I love RU’ing. The schoolish side of my brain wants so much for my son… the other side wants peace and inner harmony for him. Off and on I think that there has to be hope for my son’s intense lego interest and of course the universe conspired to throw this site and article towards me just as i was wondering if the lego phase was getting a bit much (all in my head of course… Raghu at present breathes, thinks and talks in lego) http://www.brickartist.com/ Go figure… lego can lead to money after all… ooops schoolish mind talking again. Zoya has shown a passion for dolls recently and was so happy to accept Raghu’s surprise gift of a barbie doll (he found it at a supermarket in the baby aisle and immediately said it was the perfect gift for Z) . She is mothering the doll and acting as hairdresser too. She came accross a barbie for the first time at a homeschooling friend’s house and seemed to enjoy the doll a lot. Raghu had noticed and remembered. So many shifts internally, off late, that i can’t begin to line up and write about them. Slight and small they may be but they definitely make for a more harmonious relationship with the kids.